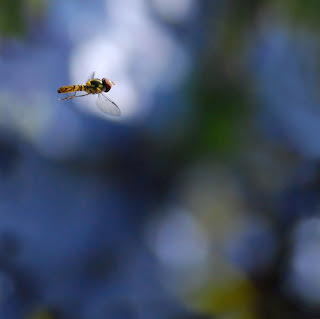 “Hovering fly” courtesy of wolfpix. Can I tell you about something both magical and mundane, about life and death, about a ballet danced in the twilight of my backyard? It involves the birds living in the neighborhood, a giant, brittle willow along the fence line and a thousand beetles that escape from the willow just after sundown. I was sitting under the tree in the corner of the yard, drinking the last wine in my glass and listening to my husband summarize an article on Somalia. Suddenly I noticed tens, then hundreds, of bugs fluttering above my head, all heading away from the willow, through the backyard and over the rooftop. Just as I noticed, so did the dozen or more starlings, sparrows, finches and blue scrub jays. They shot off the tree branches, pinched bugs from the air and flew to a telephone line with dinner. I called for the kids to come see. Two and then three times, swarms of bugs left the safety of the willow and were sent into dizzying confusion as birds pirouetted among them. Some of us cheered for the bugs when they disappeared over the rooftop and some for the birds when they nabbed in mid-flight. We watched until the cloud of bugs dissipated and the stragglers were picked off with ease. The birds flew to their perches and we waited with them. Minutes passed. Not a single beetle took to the sky. So we went inside and closed the curtains, leaving the birds staring intently into the empty twilight. Next post: Hue are you? First, I love this story. It really is so mundane and magical. Magical for us. Mundane for them (the birds). Second, Emerald Salad rocks the house! It is so good and now one of my favorite recipes of all time. Thank you for hooking me up!